HDATS:Avoid Air Compressor Breakdown due to High Discharge Air Temp. HDATS or High Discharge Air Temperature Switch will protect your air compressor from the breakdown in case of high discharge air temperature. It is most important to prevent your Air Compressor from the breakdown. Because breakdown not only increases maintenance cost but also suffers your Engineering Production. Here HDATS will help you in this case. You have to bear production loss due to the breakdown of the machine. Many safety switches as like LOPS, LCWPS, HDATS etc. are installed for the safety of an air compressor. Out of these safety switches, I will share the information on HDATS with you. Hope you like it. If the temperature of discharge air is more than the requirement, it could stick the piston inside the cylinder. 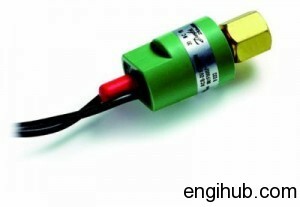 An INDFOS Make RT-120 high discharge air temperature switch is normally used for the safety of Air Compressor. This switch having two meters long capillary connecting the switch and the bulb, with thermowell to fit the bulb. Fit the thermowell in air discharge line in the direction of discharge air flow in an angular direction. This must be in between the compressor and AFTER-COOLER, closer to the cylinder discharge. So the discharge air temperature safety can be done. If it has to monitor the air temperature before AFTER-COOLER. Fit the HDATS after the AFTER-COOLER, if it is to monitor the air temperature after AFTER-COOLER. HDATS has to be set to some high value which is recommended by the manufacturer. Hence it is essential to set the temperature switch outside in an oil bath. It is having a steady required temperature at the switch to be set. Keep the differential set at zero, connect an Ohm meter across Normal closed (NC) contact of the switch. Immerse the bulb and thermometer in the oil bath, keep stirring. Set the high Discharge Air Temperature Switch at 170-degree centigrade, on the main scale. Control the steady temperature 170 degrees centigrade of an oil bath, now close contact of a switch should change & the Ohm meter pointer should show infinity, if not, reduce the setting till the contact changes to open. Increase the temperature setting if the contact opening before 170-degree centigrade till it closes and opens. Now the switch is set at 170-degree centigrade. Your Air compressor is safer if you provide more safety devices. It is not possible to install all the safety due to cost or technical problem but still, I recommend installing Low Oil Pressure Switch, Low water Pressure Switch, and High Discharge Temperature Switch & Motor Overload Relay. These four safety switches are essential to run your Air Compressor without trouble. After setting the switch, install near the thermowell, fill compressor oil in the thermowell and insert the bulb of temperature switch slowly. Wire the control cable in control panel to Normal Close (NC) Contact of the switch.